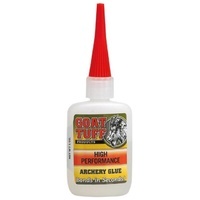 Goat Tuff Archery Glue are the purest, strongest, fastest setting and easiest to work with on the market today. 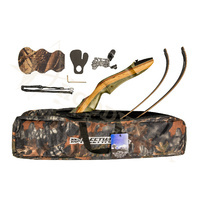 Can be used for more than just archery including around the house, in the yard, hobby building or in a shop. When the need for the strongest glue arises, GOAT TUFF will come through. Size: 2oz (59.14mL). 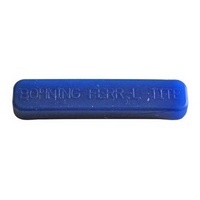 Can be used to fletch up to 60 doz arrows. 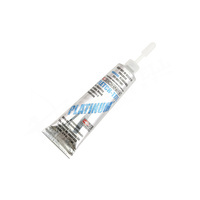 Cyanoacrylate glue is engineered to cure quickly when applied using a very thin glue line. Use glue sparingly. Less is better. GOAT TUFF glues contain no solvents and are nonflammable. Will bond a broad range of materials including most plastics, rubber, leather, metal, wood and more. To guarantee the maximum performance characteristics of the glue, parts to be glued should be clean and free of all contamination. Unlike many commercial types of glue, GOAT TUFF cyanoacrylate glues have a shelf life of up to two years. For maximum shelf life of unopened bottles store glue in a cool dry place (7 to 22 degrees celsius) and out of direct sunlight. After bottle has been opened always store in an upright position, DO NOT refrigerate after opening. To prevent glue contamination do not mix glues, or pour new glue into used glue bottles.